Relief pitchers can get a tough rap, with one bad outing resulting in inflated numbers that they have to work to improve for the rest of the season. With a limited amount of appearances to leave their mark, relievers need to show their stuff in short appearances in order to continue their path to the major leagues. The Twins Minor League Report authors each voted for the five awards being handed out this week. Today, we'll take a look at the top relief pitchers in the Twins minor league system for 2015. We each voted for out top six performers in this category. You'll see short profiles of our Top 6, but first, here are some honorable mentions. Here are the top six vote-getters for the Twins Minor League Relief Pitcher of the Year. In his first professional action since the Appalachian League in 2012, Chargois made a strong impression back on the mound. He underwent Tommy John surgery in September 2013 and he enter the season with a lot of buzz out of the Instructional League. In his second appearance back on the mound, he was lit up for four earned runs on five hits while only recording one out. Over his next 14 appearances with Fort Myers, Chargois did not allow an earned run while holding opponents to a .137/.214/.196 batting line. His streak continued after being promoted to Chattanooga and it only came to an end after two months and 20 appearances. He ended the year with another impressive run as he gave up one earned run on 11 hits over his last 19.2 innings with 24 strikeouts. Van Steensel started back in the Florida State League after finishing the 2014 campaign with the Miracle. Fort Myers relied a lot on the Australian native throughout the year as he compiled the best professional numbers of his career. He got off to a strong start in the month of April with a 1.35 ERA and 22 strikeouts in just over 13 innings. June was also be a good month as he held opponents to a 0.796 WHIP and 20 strikeouts in 16.1 innings. Right-handed batters actually hit worse against the righty as their OPS was 17 points lower. He led the Miracle in saves, games finished, appearances, and he finished second on the team in strikeouts even though he never made a start. The Twins have gotten quite the run out of the 46th round pick in the 2010 MLB Draft. Achter has made appearances with the big league club in each of the last two seasons and he continued to improve himself in the minor leagues. Throughout the entire season, he only allowed opponents to hit over .190 against him in one month (June) and that was the month he made his fewest number of appearances. Achter put up some crazy numbers in May (12 appearances) with a 0.75 ERA and a 0.42 WHIP while opponents hit .103/.125/.179 against him. He tied for Rochester's team lead with 14 saves and lead the relief pitching core with 48 total innings. After some up and down appearances through the first month of the season, Peterson hit a nice groove near the beginning of May and stretched it all the way to July. During that time he didn't allow a run over 26.0 innings while striking out 33 and holding opponents to a .103/.161/.115 batting line. During that stretch he was promoted from Fort Myers to Chattanooga where he'd finish the season. His time in the Florida State League was outstanding as he posted a 0.85 ERA and a 0.92 WHIP. The jump to the Southern League saw his ERA jump to 3.38 and his WHIP bump up 55 points. Peterson was almost a year and a half younger than the other pitchers at Double-A so it was an overall very impressive season. Tonkin hasn't been able to stick at the big league level over the last handful of years but he showed that he can thoroughly dominate hitters at the Triple-A level. Tonkin changed rosters nine different times this year including one stretch where four straight appearances on different teams between Rochester and Minnesota. From June 30 to August 29, he allowed two earned runs in 28.0 innings with 28 strikeouts and two walks. Opponents hit .160/.186/.202 against him during that stretch and Rochester handed over the closer role to him to end the year. Even with all the trips to Minnesota, Tonkin stilled tied Achter for the Rochester team lead with 14 saves and he had the best ERA of any pitcher on the staff. Tonkin doesn't have much left to prove at Triple-A so it will be up to the Twins to find him a big league role for 2016. 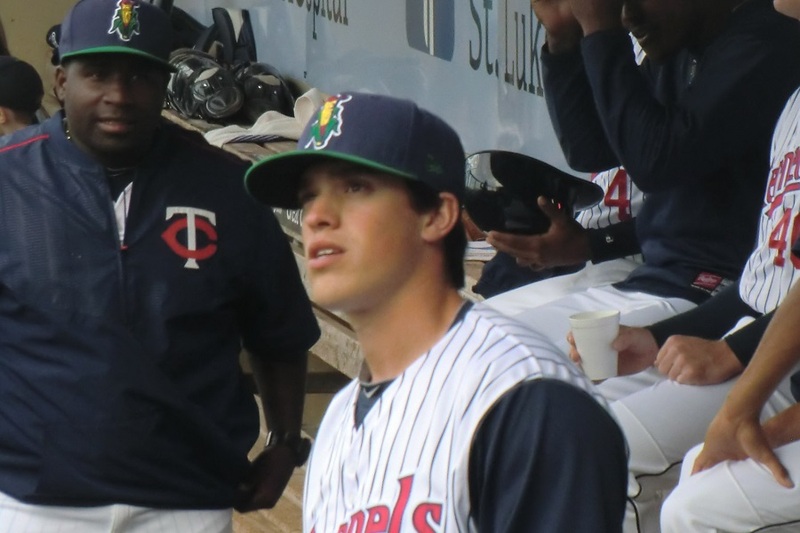 Hildenberger, a 22nd round pick in the 2014 MLB Draft, spent all of his debut season pitching for the Twins two rookie league affiliates. His numbers were good but that can be expected for an experienced college pitcher going against younger hitters. He finished the 2014 season with a 2.48 ERA and a 1.10 WHIP with 32 strikeouts in 29 innings. This year would be a test as he would be asked to make the jump to the full season leagues and test his stuff against some older competition. He wasted very little time making his mark in Cedar Rapids. In the month of April, he allowed one earned run on six hits in ten innings with 13 strikeouts. He continued his masterful mound performance into May as he didn't allow a run for the entire month while striking out 23 in 18.2 innings. In fact, Hildenberger had a stretch from April 19 to June 21 (31.1 IP) where he allowed one run on 11 hits with 40 strikeouts and four walks. Batters could only compile a .107/.148/.117 line against him and he struck out 36% of hitters during this impressive run. Hildenberger's numbers jumped up a little during his 13 appearances in the Florida State League and he has been older than the competition at every stop along the way. Next year will be huge for him as he will likely spend some time back in the Florida State League before making a jump to the higher levels of the minors. It was a very impressive season but there's still room for him to grow in the coming years. In an attempt to be transparent, here are the ballots from our Twins Daily minor league writers. Always an interesting read for those of us who don't get a chance to watch MiLB games! For Trevor Hildenberger:with his overwhelming success in A-ball, wouldn't a move to AA next year make sense? What to do with Michael Tonkin?Hook him up with another organizations AAA affiliate and see how he does against different hitter?He's 25 and in the MiLB since 2008.Somethings gotta change, right? Regarding Hildenberger, there is certainly a chance he jumps right to AA next year. We'll see how the AFL treats him. He wasn't quite as dominant in the FSL as the MWL, but still very good. Wouldn't hurt to get a month or so to start the season with the Miracle, but he should move up from there. As for Tonkin, he's out of options in 2016, so the Twins will have to make a decision. I can't see them letting him go, so I think he'll finally get that extended look we all think he warranted but hasn't received. Are any of these guys close to being exposed in the rule 5 draft? An interesting list - especially when compared against who I might have predicted back in April. JT Chargois needs to be added in November (and I think he's a given to be added). Just chatted with Todd Van Steensel. He is Rule 5 eligible this year. Obviously AJ Achter and Michael Tonkin are on the 40 man already. Hildenberger doesn't have to be added until after the 2017 season. Brandon Peterson needs to be added after the 2016 season. 2* no question JT is a great story! But how about Bard? Low A or not, his coming back and performing so well might be a better one. 3* these guys plus others not listed, and several milb SP options should bode well for the Twins bullpen in the immediate as well as the future. I just hope they don't get complacent and choose to do nothing this offseason. Another good arm or two could really set the Twins bullpen up for a strong 2016. The Southern League seemed to eat up a lot of relief pitchers this year. The FSL is always a very pitcher friendly league while the Southern League is probably slightly hitter friendly. The parks in the FSL are usually pointed to as the main culprit, but I wonder if the umps in the Souther League call a tighter strikezone as a lot of relievers (Burdi, Jones, Chargois, Reed) had a drastic difference in walk rates between the two leagues.